My first signature holiday desserts were cheesecakes inspired by cocktails. I started doing them about 10 years ago. I tried making all sorts of creamy cocktails into cheesecakes like mudslides, bushwackers and buttery, well you know. And of all the ones I tried, my white Russian cheesecake was by far the most popular. So popular in fact, I was making at least 2 every year until my mother-in-law begged me to stop making them because she would eat the whole cheesecake. She had no self control, and neither did I. If someone else in the family hadn’t finished off the White Russian cheesecake, I would. So to spare all those holiday pounds my family was directly blaming on my cheesecakes, I decided to make them in mini size. This way there was no reason for anyone to complain that their jeans didn’t fit anymore because they couldn’t control themselves around my cheesecakes. For these White Russian Cheesecakes, I start with a basic cheesecake recipe which is a brick of cream cheese, an egg and 1/4 cup sugar. Then I add the flavor of a creamy White Russian. My recipe for a white Russian is coffee liqueur, Irish cream liqueur, vodka and cream. Since the cream cheese is going to act as the cream, we’ll leave that out. We’ll also omit the vodka since it has very little flavor. So that leaves us with the coffee liqueur and Irish cream liqueur. I add a tablespoon of each along with some good vanilla extract. 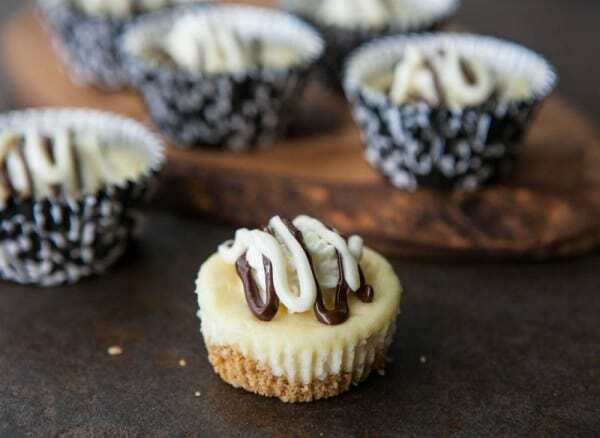 For these cheesecakes I used PHILADELPHIA Cream Cheese. Do you know they have been America’s favorite cream cheese since 1872? It’s amazing! I wouldn’t trust any other brand of cream cheese for my holiday cheesecakes. I like to “Bring Out the Silver” when I’m making cheesecake. What makes PHILADELPHIA Cream Cheese so good? From real jalapeños in its Spicy Jalapeño cream cheese spread to crunchy pecans in its Honey Nut cream cheese spread, PHILADELPHIA Cream Cheese provides delectable, varieties to choose from. 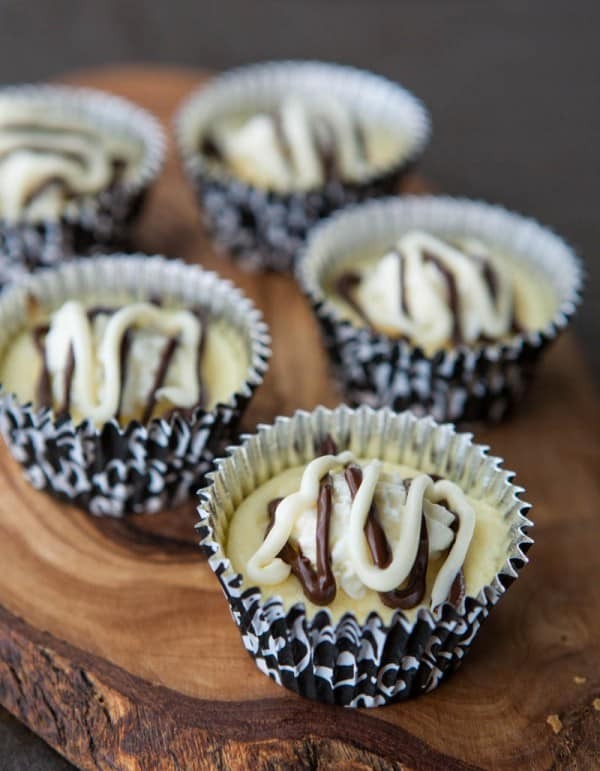 Be sure to visit CheesecakeCheer.com for more holiday recipes and tips. Mix graham crumbs, 2 tablespoons sugar and butter until blended; press onto bottoms of 18 paper-lined muffin cups. Beat cream cheese, remaining sugar, vanilla, coffee liqueur and Irish cream liqueur with mixer until blended. Add eggs, 1 at a time, mixing on low speed after each just until blended. Spoon into crusts. Beat whipping cream with mixer on high speed until stiff peaks form; spread or pipe onto cheesecakes. Melt chocolate and white chocolate. Drizzle cheesecakes with melted chocolate. This recipe sponsored by PHILADELPHIA Cream Cheese. All opinions 100% mine. 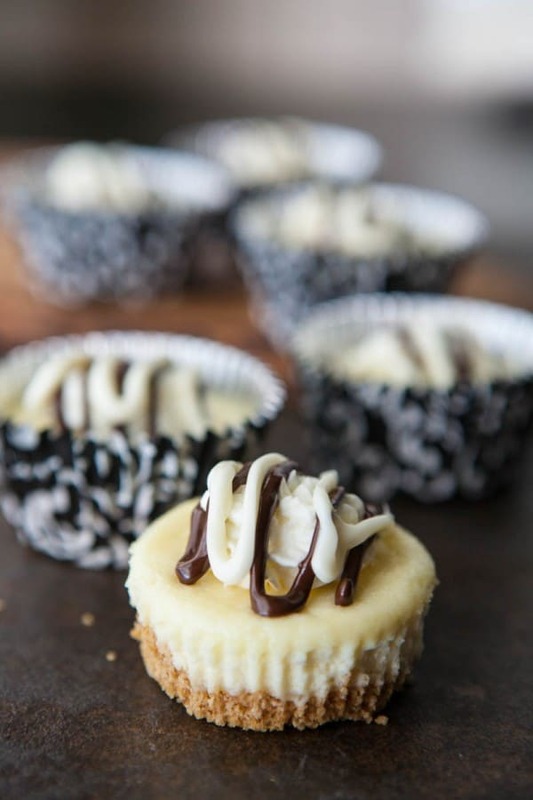 Love the idea of a White Russian cheesecake! And minis are always a good idea in my neck of the woods, because I have a documented complete lack of self control when it comes to cheesecake in general. I can’t tell what size they are. They look like the mini cupcakes but there is not a picture that would tell if they are the regular or minis. PLEASE HELP IM TRYING TO MAKE THESE FOR XMAS… DOES ANYONE KNOW HOW I WOULD MEASURE IT OUT? HOW LONG INT THE OVEN? These are made in regular size muffin cups and filled 2/3 full. You can also make in mini muffin size, filling 2/3 full too. Thanks Angie would you know how long to bake it for? Also could it be made a day or 2 ahead? Prob close to 12 – 15 min. Just touch the tops of them to make sure centers are set. It may take a little longer, I haven’t done mini sizes with this recipe. And yes you can make them a day or 2 ahead of time and refrigerate before baking. This sounds amazing – I would like to make it as one whole cheesecake though. Can you tell me the baking instructions for that? Thanks!